The Aegean Sea is one of the most majestic venues for luxurious sailing vacations in the Mediterranean Sea. Apart from the well known Cyclades and the Dodecanese, the Aegean hosts also two lesser known areas: the Northern Sporades and the Eastern Sporades. On sailing vacations longer than one week, it is possible to combine several of these, and Andros is an ideal stepping stone from the Cyclades towards the Eastern Sporades (Samos, Ikaria, Chios, Patmos) or the Dodecanese (Kos via Mykonos, Naxos and Amorgos). Together with its neighbour Tinos, the island of Andros is well known for its dream beaches and spectacular sceneries, with lots of beautiful ports and anchorages that provide shelter from the Meltemi. For these reasons most itineraries include Andros even though the adjacent islands of Mykonos and Delos are more famous (though many would say: overrated). Starting your sailing vacation in Syros, Samos or Lavrion allows you to visit Andros and Tinos. Starting from Athens, Rhodes or Paros is less straightforward but is possible in 10 day, 14 day or 21 day itineraries. Options for sailing vacations in these waters are either fully crewed (motor sailers & gulets) or bareboat (with or without skipper). 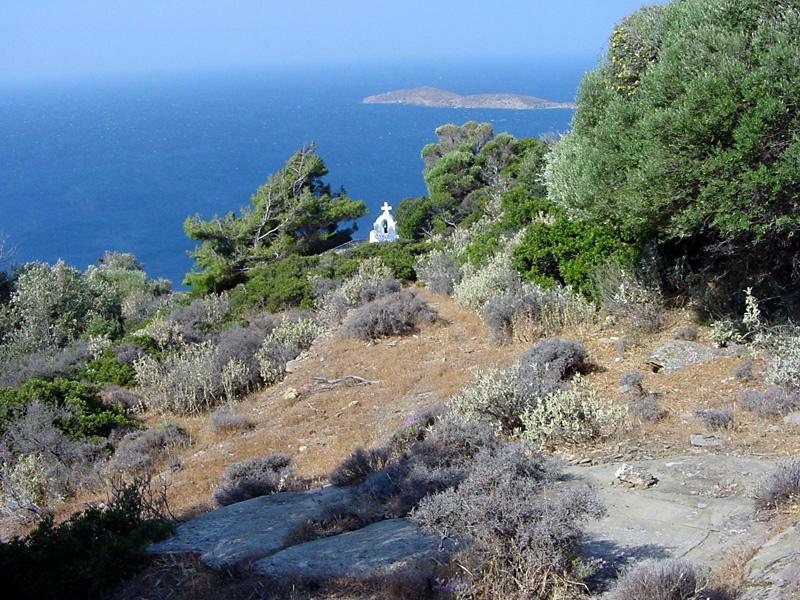 The photo above shows the characteristic shores just south of Batsi, with the island of Megalo in the distance.
.: Back to Andros island:.